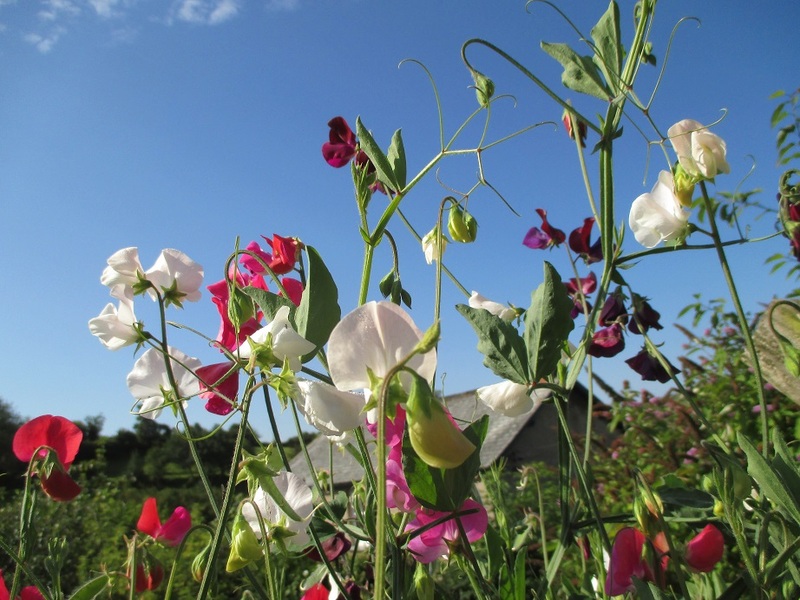 Sweet peas, the scent of which takes us back to summers past and gives us hope for those to come. These fine specimens have been tended by Lady Mantle who has taken her role of guardian very seriously. She has diligently removed tendrils before they could contort and sully the blooms, tying in the now anchorless stems to sturdy canes. She has picked on regular basis encouraging a steady flow of flowers and scanned for foes who wish to nibble on the new shoots. The upshot of this dedication is that the Mantle ancestral home is full of fragrance and there have been plenty to share with friends, neighbours and serfs. Are there any spare serfs going? I need about 10. Will pay with lilies and pond weed (scent and oxygenation that money can’t buy). I have always loved them after my mother told me that someone brought her a bouquet after my birth. Maybe my name has something to do with it. Lovely! Do you have any particular favorite cultivars for scent? At one of my gardens we are growing Jilly, which is lovely – creamy white, long stems and beautifully fragrant. I heard that the lighter ones are better for scent, but I don’t know if this is true. I usually chose for name and not so keen on the frilly ones. And mine, but I do have a very long special favourite list!